kiev wrote: The box has a nichicon part number, and looking thru their website i found they take credit for the miev OBC. 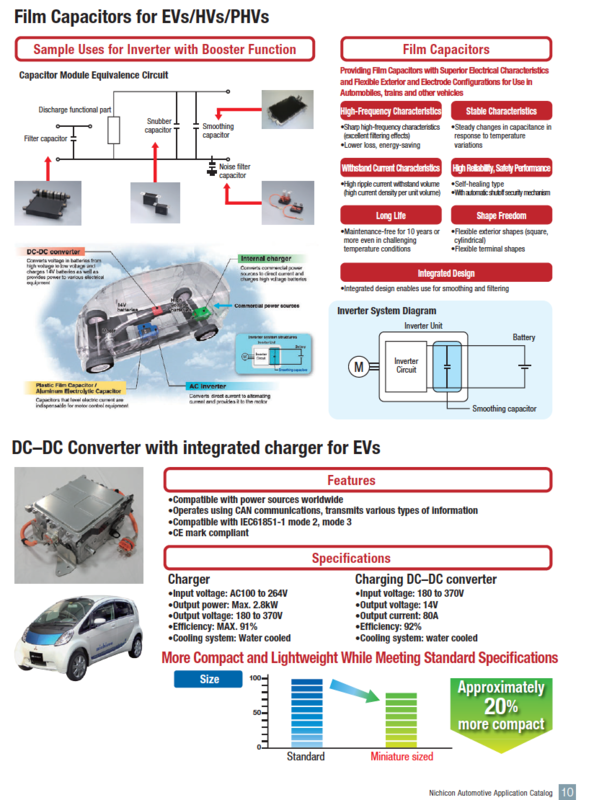 In fact they claim that it worked so well for Mitsubishi that Nissan converted over to using their design in the Leaf. anyone ever get any information on removing the top speed limiter or the torque limiting that seems to occur? "re map" the MCU?? my project isn't "normal" so more power for temporary bursts would be great. Here is before charging started. 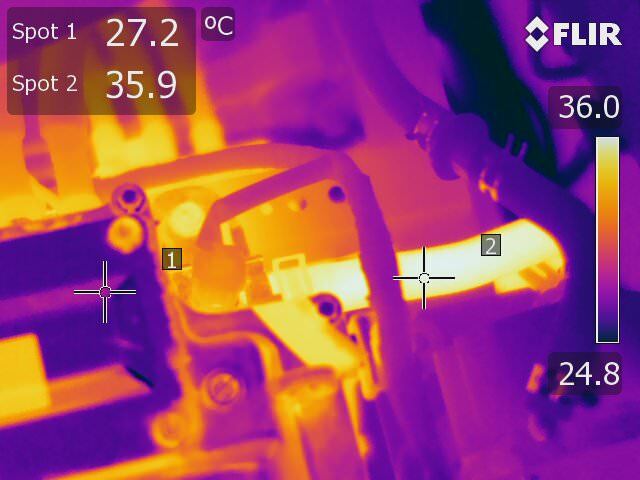 The residual heat from driving several hours earlier still shows up in the coolant tube near the top of the picture. kiev wrote: Curiousity killed the cat. Are these merely because the cover is thinner at those points? 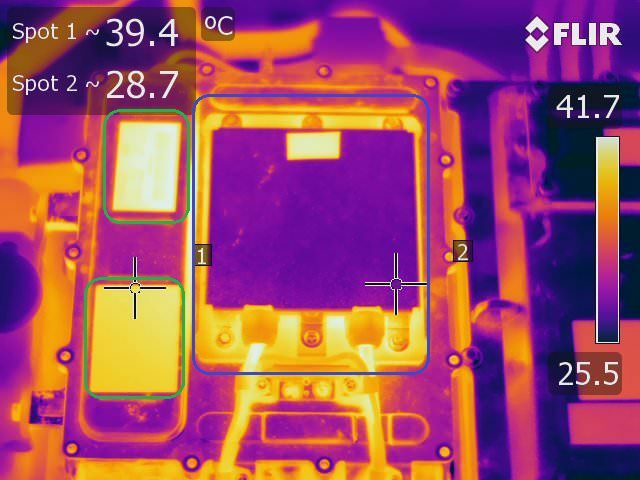 I can't see any internal structures that would correspond to the hot rectangles. Unless the blue rectangle is the waffle plate™ showing through, but it seems unlikely to remain that sharp. The mains cables really have fire in them, huh? At least from these shots with the cover on. It certainly seems that it's the magnetics that get the hottest. Of course, they can stand it, but they transfer a lot of their heat to the capacitors and semiconductors, which will age. 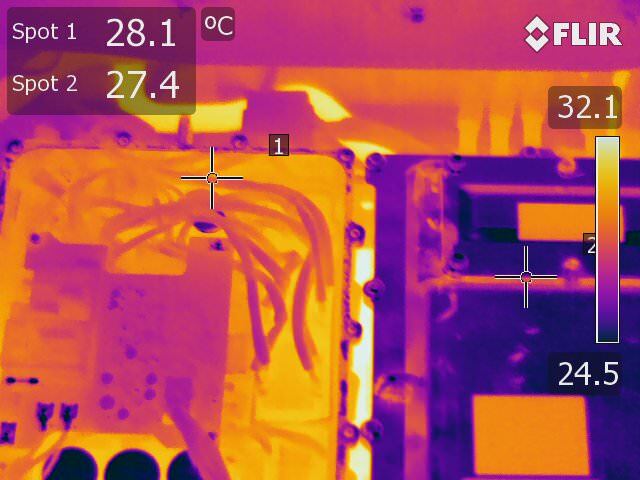 Edit: however, the capacitors, at least the tops of them, seem quite cool compared to the furnace elsewhere. Those rectangles are silver/aluminum labels on the cover which can reflect and give false readings. i probably should have covered them with black tape. i did put black electrical tape on the caps which is supposed to allow a temperature measurement rather than a false reflection of the aluminum tops. Compare the before and after with cover off to see the caps and tape. The big blue rectangle on the top is the external EMI filter bolted to the lid. It too has an aluminum label, as does the MCU located to the right of the OBC. There is already a small ~1/2" vent hole in the front left side of the charger--it has a plastic (filter?) plug. So maybe another hole could be added near the right rear corner by the inductor to blow air in, and remove the plug to let it flow out. Aerowhatt wrote: Jay if I'm understanding your description of the motor bay hatch insulation on your 2012 it actually touches the top of the charger unit? The 2014 hatch definitely has some air space between the hatch sound insulation and the top of the charger. I would guess somewhere around 3/4 of an inch. The insulation is molded on the bottom side to provide this space. Aero, I mistook the molded relief space to be in contact, but there's no rub marks or a dust shadow to confirm this, so yes- no contact. How about some teaser photos of your blower prototyping? Wife's getting tired of me opening the motor bay hatch and cracking all windows during a recharge..
jray3 wrote: .. Wife's getting tired of me opening the motor bay hatch and cracking all windows during a recharge.. I don't think it's paranoia. Given the internal temps that Kiev has posted it's a valid concern. I've gotten the blower airflow optimized and my wife is out of town this weekend. so I should get the bracket jig together and a few brackets made (she calls things like this "goofing off" so perfect timing ). Kiev has been generous enough to agree to taking new readings with this kit in place on his iMiev. I'm waiting to get delivery on the thermal switches to make them automatic. Currently, I have turned a switch up in the shop (wrong type for the environment, but right temperature rating) and wired the prototype on my car up with it. Really, really like hearing it kick in and do it's valuable work throughout the whole charge cycle. I haven't caught the end of the charge cycle yet so I don't know how long after the charge ends that the unit continues to run. 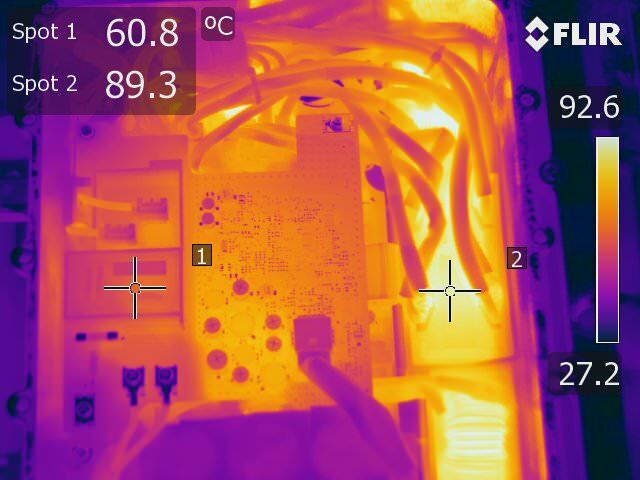 I'm not worried about that though, only pulling 0.7 amps it doesn't put a dent in the 12V battery while getting cooled down enough to turn itself off. So a bit of an update. I have had the updated bracket in the car most of the week and working in "automatic" mode. The thermal switches that I ordered for this project are set to arrive in tomorrows mail. So far I'm pretty happy with the function (these are all L2 charges). 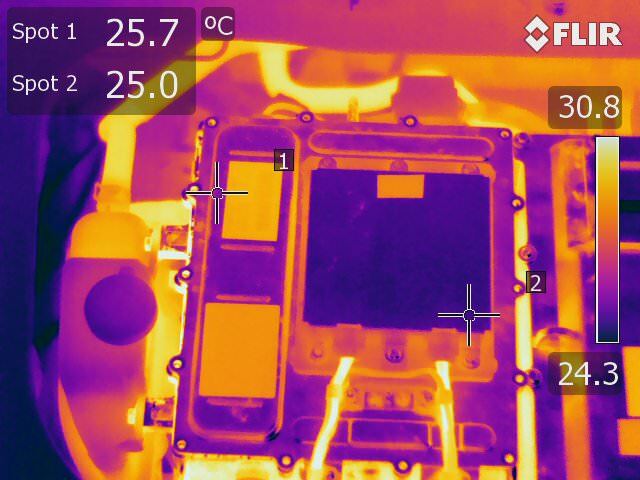 With the temporary thermal switch, it comes on in the first 30 minutes of charging starting. Only about 5 minutes if it has just been driven with the AC cranking. Then at the other end of the charge it lingers, running anywhere from 20 minutes to 70 minutes after the charge ends before turning off. 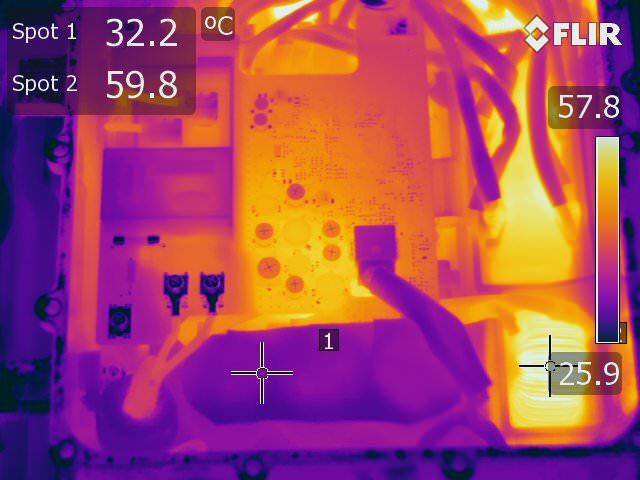 Definitely making a significant difference in the overall temperature of the unit during charging. 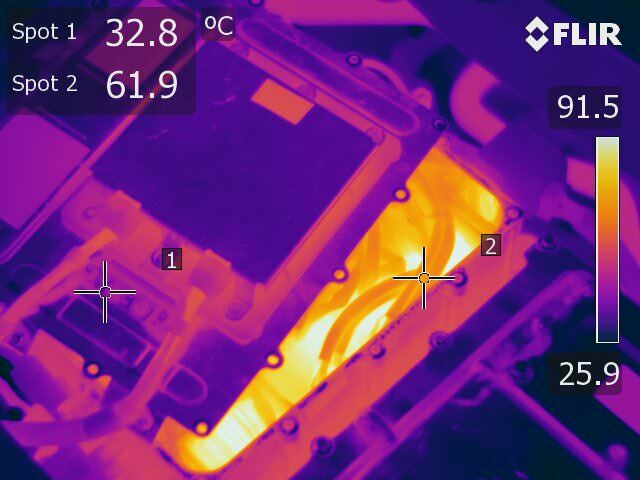 Really looking forward to Kiev's imaging comparison for a more quantitative read on internal component temperatures. You can just see the blower under the bracket. It is held in place by the channel over the lip of the "hood" opening. And a single bolt in the existing threaded hole on the charger case.